The double-action Infinity is the brush I use for 90% of my all airbrushing work. The remaining 10% goes to the Evolution or Grafo (these are estimates, your mileage may vary). When outfitted with the 0.15mm tip, the Infinity is capable of spraying fine 0.5 mm lines with ease. 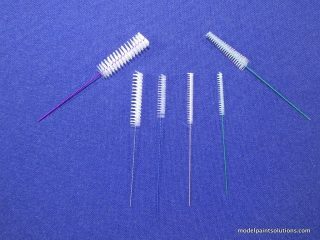 Larger scale models (1/35, 1/32, 1/24) and/or clear coats may be better handled with the 0.4 mm tip. 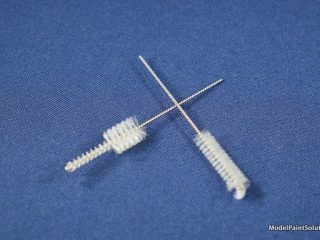 No worries however as changing tips and needles is easy and takes just a few moments. The gold-colored dial with chromed knob at the end of the brush is the “Quick-Fix with Memory” function. Turning this knob limits lever travel locking the “sweet spot” in place: where the lever is giving you the line you want. This greatly reduces the chance of over-controlling during fine-line spraying. 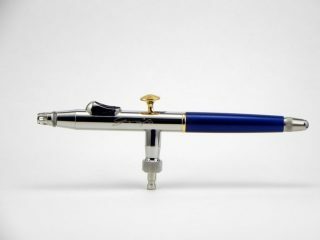 By toggling the chromed button, the memory function allows you to clear the tip with a full stroke of the lever then quickly return to the sweet spot. Very handy, indeed. 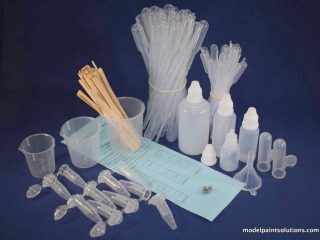 The “2 in 1” package comes with both the 0.15 and 0.4mm nozzle/needle sets plus 2 and 5ml paint cups. 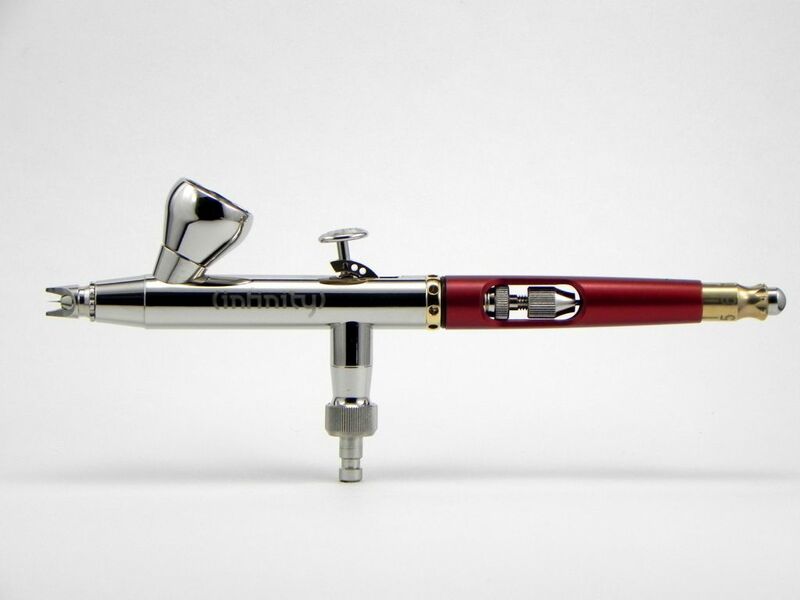 The Infinity “2 in1” provides the tools for both fine-line and large-scale airbrushing in one box. To increase it’s fine-line capability, the Infinity is easily fitted with the Harder & Steenbeck Fine Pressure Control Valve (MPS-HS-006). Bottom line: The Infinity “2 in 1” is a lot of airbrush for a good price. 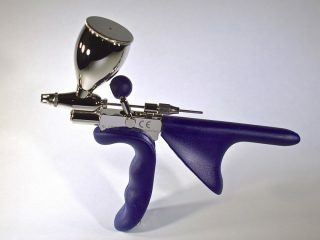 As a complimentary service, your airbrush will be inspected, lubricated, and test sprayed by John. 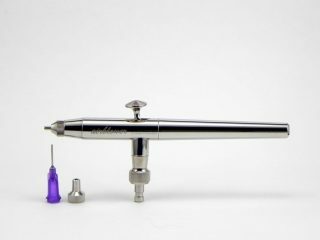 When ordering an airbrush, your order qualifies for free shipping – choose Free Shipping at Checkout for your airbrush order. When you purchase an airbrush from MPS, we guarantee to help you make that brush perform as it should. Whether by email, phone, or Face Time/Skype, you’ll get the assistance you need. 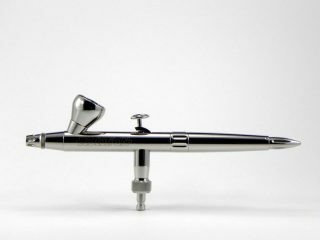 With an H&S airbrush from Model Paint Solutions, you get free labor for all repairs and a 5% discount on H&S parts. You pay for shipping. Model Paint Solutions is an Authorized Harder & Steenbeck Reseller.